Meticulously engineered. WorldTour tested. 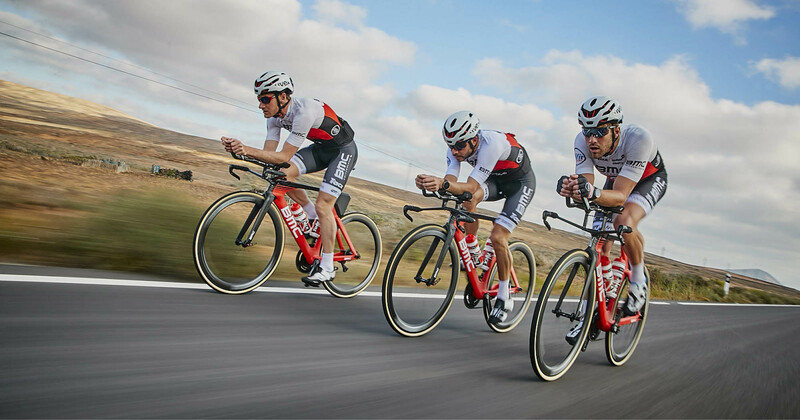 The Teammachine is the pinnacle of Swiss cycling performance. The Teammachine has won them all: the Tour de France, the Olympics, World Champions, and Classics. Nobody knows the Teammachine better than the pros who ride and vouch for it. We've taken their insight and combined it with the new peloton-standard of disc brakes to create the ultimate race bike. Repeated design refinements have retained the Teammachine's crown for the world's most race-tuned balance of weight, stiffness, and compliance. Constructed with 01 Premium Carbon, ACE and TCC Technologies, our ICS cockpit, and D-Shaped seatpost, the Teammachine SLR01 Disc delivers optimum performance and integration for the modern road racer. Race-proven technology, now with disc brakes. Sharing all of the valued design features of the SLR01 model, the Teammachine SLR02 Disc is engineered with our lightweight 02 Carbon, ACE Technology, and a D-Shaped carbon seatpost. Race-tuned compliance and the addition of disc brakes delivers precision handling and control. Our ACE technology evaluates thousands of frameset designs, streamlining years of physical testing and prototyping to ensure the final product delivers the performance riders demand. The aesthetic simplicity and innovative functionality of the Integrated Cockpit is the epitome of Swiss engineering and design. ICS keeps cables and housing in their place: out of sight. All-day race compliance: designed to keep you fresh over long days of racing and intense training. Road vibrations are filtered out for a smooth and efficient ride. Aesthetics shouldn’t be an afterthought. Our DTi allows BMC frames to look and ride like the precision machines we designed them to be, regardless of drivetrain variations. Frame stiffness where necessary and compliant where desired for a balanced ride and intuitive feel. The D-shape delivers more compliance and has less material for a lighter overall weight. Proprietary, super-light thru-axle and sandwich derailleur hanger to reduce weight. The Teammachine responded exactly as expected for a race bike – it was snappy and direct – yet without any nervousness. Both versions were natural fit and I fell immediately into knowing how they would respond. At the Same time, the Teammachine was tame and forgiving. The result of 34,000 prototypes generated by a supercomputer the size of a room, the new BMC Teammachine SLR01 Disc was worth waiting for. An incredible machine to ride and even just look at. The BMC Teammachine SLR01 Disc accelerates, climbs, corners and descends like a world-class race bike. It’s comfortable. Its lines are clean. And it can stop – in control – on a dime. Bravo, BMC. A winning combination of speed, sharpness, and comfort. BMC’s Teammachine SLR01 Disc Team took home an Editors’ Choice award because it offered a winning combination of speed, sharpness, and comfort. Every race bike should feel like the BMC Teammachine SLR01. Climber, rouleur, sprinter or puncher; the frame knows how to appease every riding style. The BMC Teammachine SLR02 Disc One Brings the Speed, saves the Cash.